Hello Spooks and Ghosties and Wizards! Guess what! It's Autumn! Well.....it is me, but I mean to say it's Fall! I am super happy since this is my second most favorite time of year. It also means it's time to start talking about the Halloween Run! 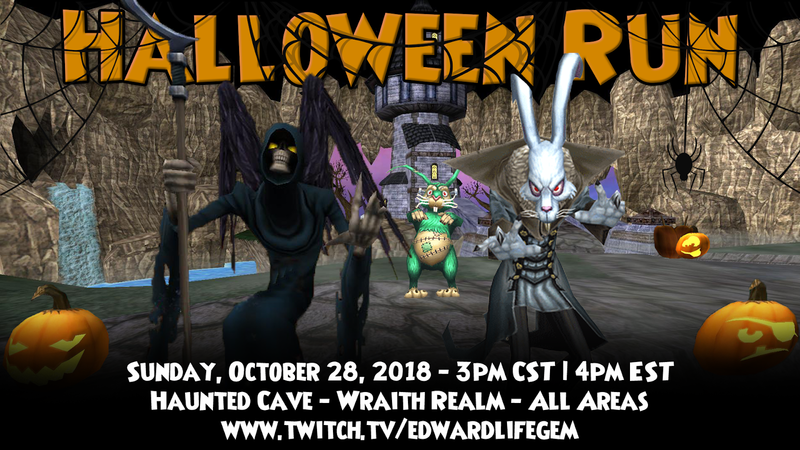 This year marks our 3rd Halloween event in Wizard101. See below for more information and be sure to read till the very end for a special surprise! Streaming will begin at 12pm CST / 1pm EST! Click this link to go to our stream! Watch the video below to see where we will be running! Edward Lifegem's Halloween Run Raffle! These events are a ton of fun, so get your costumes ready and join us on October 28th! We have lots of activities and surprises planned for all of you, including an all-new activity that has never been done before but we think you guys will LOVE! Hope to see you there!